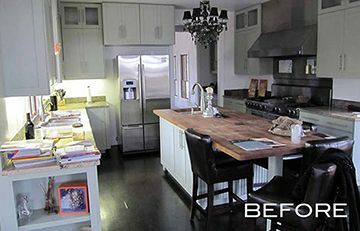 Before R Designs took ahold of this Westlake kitchen, the colors were bland, the appliances outdated and the overall atmosphere did not inspire culinary evenings. 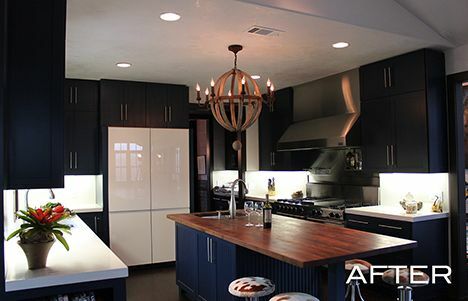 R Designs chose a bold, deep saturated blue for the cabinets and contrasted it with stark white custom 3cm concrete countertops and backsplash. The European glossy white glass front refrigerator is the gem of the space. 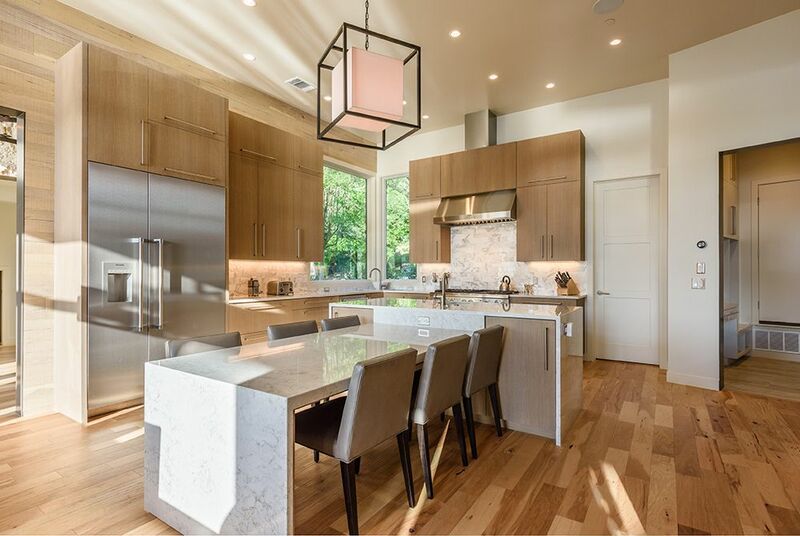 The addition of the Four Hands cowhide stools and wooden chandelier brings an earthy, warm element to offset and enhance the slick contemporary surfaces. This Texas Hillcountry kitchen was dated and dysfunctional. 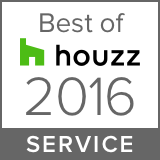 With very little storage and absolutely no style, it was in need of a fresh start. 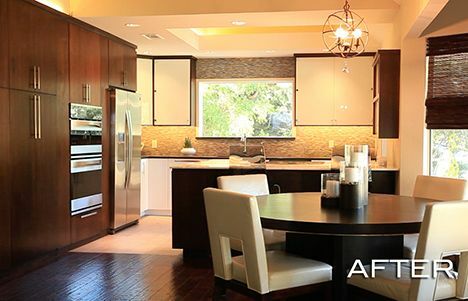 The kitchen required a complete demolition and the new design was created and executed. 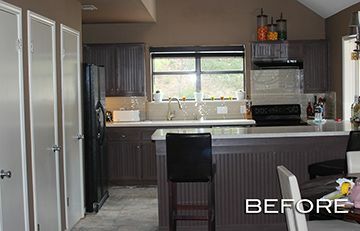 This completely remodeled kitchen now flows and functions with ease. The custom built cabinets are complete with interior door shelving for the perfect organization of spices and other ingredients. The custom created island is the exact height for chopping while visiting with guests. 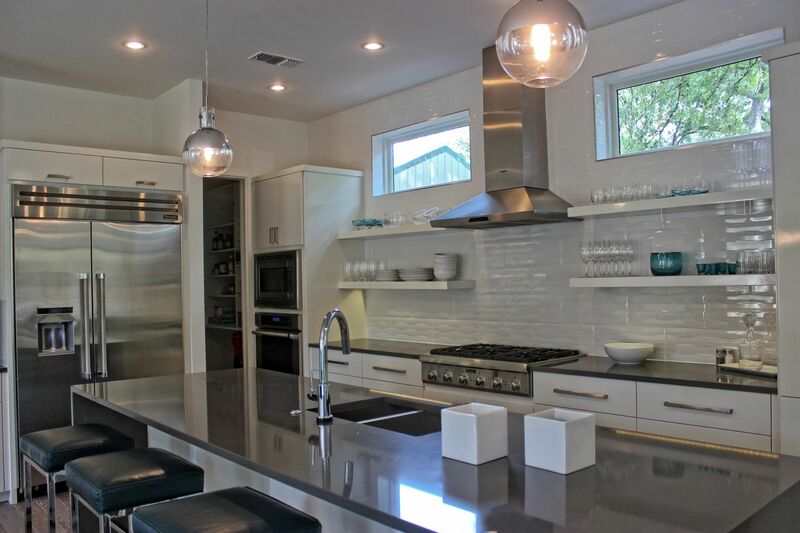 All new appliances, Silestone countertops, white glass front uppers and glossy European white lowers contrast beautifully with the deeply stained floor to ceiling wall of cabinets. 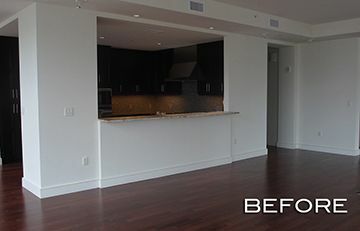 This Four Seasons Residence kitchen-living space was a blank canvas. With neutral tones and an ordinary vibe, it was in need of some sophistication. R Designs replaced the original neutral tone granite countertops and backsplash with beautiful white Calcutta marble and added a three-sided bar extension for more depth and functionality. 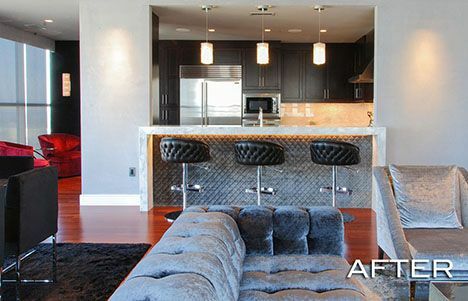 To soften the edges, a fabric wall using gorgeous velvet was applied beneath the bar. Dressing this area with Fendi leather bar stools, embellished with Swarovski crystals, this midcentury modern space entices anybody's appetite.